An early 19th-century writer described All Saints as 'a small, mean building', which is most uncharitable! All Saints is a simple Norman church in a small village near Dover. The building consists of a chancel, nave, and west bellcote. The church has a late 17th century chapel which contains a memorial to the Bertie family, showing the husband and wife holding hands romantically. The north chapel has its own striking memorial, in this case to Sir Henry Furness. The Furness memorial rises in three tiers, much like a wedding cake. It was designed by Greene of Camberwell. There are further 17th century memorials in the chancel. The interior is richly decorated with Victorian wall paintings and very colourful stained glass with an alabaster reredos. 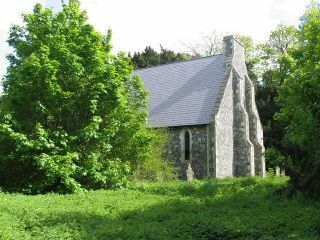 All Saints church is no longer in use for regular worship and is in the care of the Churches Conservation Trust.